Upset About Diversity in Hollywood? 'Single By 30' is a Step Towards a Promising Future. I'll admit upfront that this post is going to come off a bit self-serving considering I am one of the creator/directors of the show, but ultimately I hope you will see that it's less "tooting my own horn," and more trying to rally and unite the community behind new opportunities and perspectives! Single By 30 is an eight-episode original show that comes out weekly on Wong Fu Productions YouTube channel through YouTube Red. It's a romantic dramedy starring Harry Shum Jr. and Kina Grannis. Here's why it's an important show that you might want to get behind. Hollywood is old and slow, meaning change is slow. Why wait? I'm all for speaking up about the diversity/casting problems in Hollywood, and there should absolutely be changes in the system. But the truth is this is going to take a long time, and it will come through little roles here and there. Thanks to technology and social platforms, we're at an amazing period of time when Asian American creators/talents don't need to wait for Hollywood to give them opportunities or an audience. For over the last 10 years Wong Fu Productions has been creating content and building our audience to reach a point where we can create shows on our own terms, and proving an audience exists for faces and stories like ours! We didn't have to cater to old Hollywood and an old system, and if more AA creators and consumers opened their minds to new platforms, perhaps we would have more shows like Single By 30. "But this is just a digital show on a your YouTube channel. It's not TV." First, YouTube Red is a new premium service. Less like Netflix and more like Spotify. Access to shows like ours are part of the perks of subscribing to YTR (along with ad-free viewing and other features). Second, what is "TV" these days anyway? The line is so blurred now. Most people are watching content on their own terms, online, on their phones, without cable. Let's just say that "new media" is not "new" anymore. (Crazy I know, that term seems like it just came around right?) But imagine if just 5 years ago someone said they had a new show on "Netflix," you might scoff thinking, "Why? Isn't that just a straight to DVD service?". Or Amazon? "You mean the place I buy toiletries?" Now, both are synonymous with TV. Perception toward platforms are quickly changing, and it's more about just having great, resonating content. Single By 30 is part of that shift and as a community we should celebrate AA presence and progress on broadcast TV as well as "not so new" media. This might seem like the least important, but if you think about it, it's pretty major. 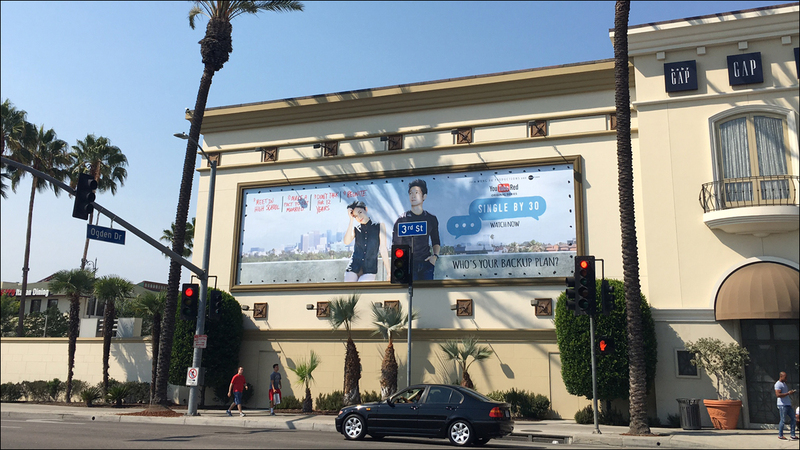 Billboards are a sign of mainstream marketing, and they're going up for SB30 all around Los Angeles, (not to mention the trailer being played in thousands of AMC Theaters around the US) and this is a pretty big deal. YouTube is putting real marketing money behind a show with Asian American romantic leads. When has that ever happened? We've had action stars, comedies, and dozens of supporting cast placements, but here are Kina and Harry, front and center at The Grove. Yup, this is for a "YouTube show." We're so proud to showcase Asian American faces in this way, a way mainstream media almost never portrays us. I've been keeping a pretty close eye on the Asian American community when it comes to entertainment the past ten years we've been doing this. I really hope our perspectives can shift when it comes to what we're chasing. Hollywood/TV roles are great, but I'm telling you there's talent, there's opportunity, there's legitimacy that is now in the digital world. We should be encouraging and cultivating our community here because this is where we have a voice. Wong Fu and millions of others are reaping these benefits and we want everyone to be a part of it. I know it's easy to say YouTube is just "cat videos," or that it's impossible to keep up with social media (trust me, I'm with you, we're the old guys on YT now, believe it or not haha) but part of any movement in any community is to take what we've learned from previous generations and apply it to new methods and talents. Thanks for reading and if you feel compelled, consider supporting the show! 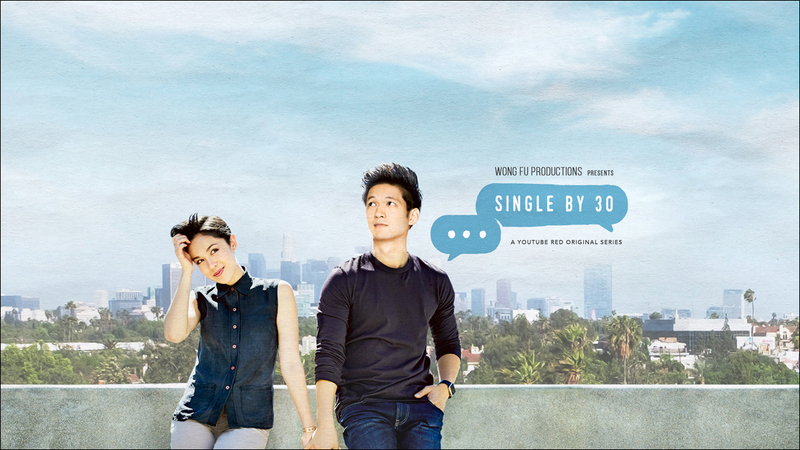 Single By 30 is available at youtube.com/WongFuProductions with new episodes every Wednesday. Episode 1 available for free to everyone. Philip Wang is a co-founder of Wong Fu Productions, an independent digital production company. They've produced hundreds of short films and comedy sketches and their first feature film Everything Before Us is now available on Netflix/Amazon/iTunes.